Bears have a knack of getting into trouble that it really should avoid, but their nature is such that they keep looking for food wherever they can find it. Humans and bears usually have a love-hate relationship, but even without humans bears do manage to get into trouble. Florida, USA - It seems that bears still can manage to get into crazy situations and this one seems right out the Winnie the Pooh book. 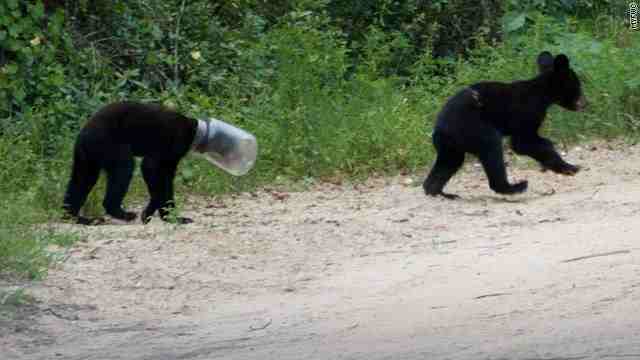 A black bear got his head stuck in a plastic jar and a biologist in Florida removed the plastic jar after the it remained stuck on the bear's head for some 10-days. The six month cub could not drink or eat during these 10-days and according to biologist the cub was just days away from dying. The bear, his mother and 2 other siblings were known to frequently visit trash cans in and around Weirsdale, located within Ocala National Forest. Biologists had given up hope of finding this bear after not being able to track its whereabouts but just as they had given up hope they found the bear. The protective mother was calmed using a tranquilizer gun and soon the bear was freed from the jar. The bear has been name 'Jarhead'; not surprising at all. Ontario, Canada - Winnie the Pooh, the most loved and favorite bear in the world got his name Winnie from a place in Canada named Winnipeg. In the stories, Winnie the Pooh would often get his head stuck in a honey jar trying to eat every bit of honey possible. Well it seems that a black bear in Canada has taken a leaf out Winnie the Pooh stories and tried to replicate Pooh's feat. The bear had managed to elude the authorities until now and there are frantic efforts being made to trace the black bear and tranquilize it before freeing the bear. In Minnesota, July 2008, a bear had to be shot as even after 6-days of valiant efforts to free the bear's head from the jar, they had no success.